A small independent TV reporter working on TV show 'LAST STEPS' (Danielle Harris, Halloween 4 and 5)and her cameraman head to a small midwestern county to investigate a case of unexplained disappearances in the area. While investigating they interview Emmett (Lance Henriksen, Aliens, Millenium) in regards to a serial killer the man knew by the name of Cyrus. Emmett expresses that the film crew do not film him as he relates the story of the serial killer known as 'The County Line Cannibal'. 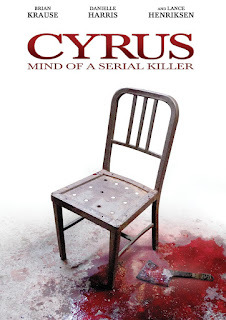 The film goes back and forth between the TV crew and the past of Cyrus as he runs a burger joint using roadkill, but soon the meat runs out and he has to turn to other means.......human meat. Though the plot is easy to follow and it is evident that Emmett has involvement with the killings this adds to the tension of the film which could have otherwise been a TV movie. As you would expect from this type of film, it is based on a true story........the truth being that serial killers exist. Well directed by Mark Vadik (Lilith) and starring a great cast made better with the quality of the special effects.